NASHVILLE — Legislation making it easier for gun-rights groups and others to challenge "gun-free zones" on locally owned government property including parks, public buses and auditoriums is on its way to Gov. Bill Haslam for his consideration. The Tennessee House took final action on the controversial bill Tuesday, voting 71-14 to agree with a Senate amendment for the bill, which has the support of the National Rifle Association but has been criticized by others. To avoid being sued, city and county governments would be forced to buy metal detectors, hire security staff and check bags. If they don't, lawyers for groups or individuals suing could win triple the amount of their costs, should they win. 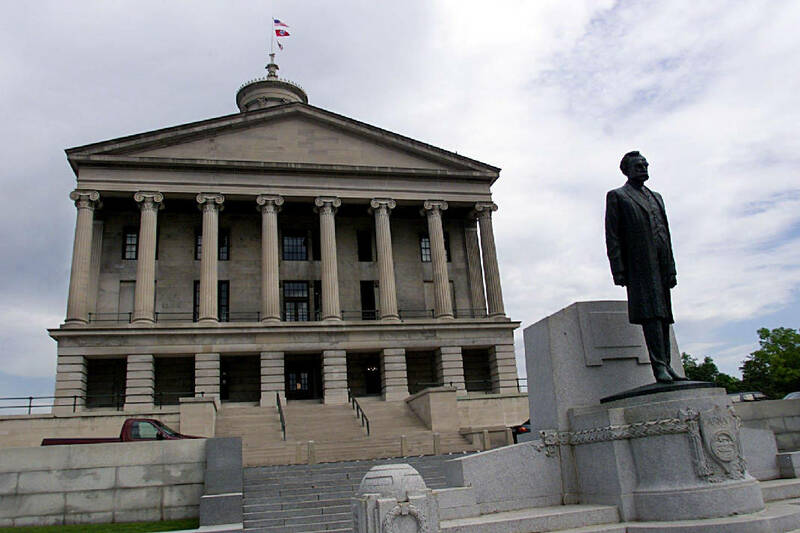 The measure was only one of a flood of bills flowing out of the Tennessee General Assembly on Tuesday as senators and representatives scrambled to finish their annual session, which began in January. But because they failed to get through, they'll be coming back today in hopes of wrapping things up. Senators continued working into the night. Earlier, Sen. John Stevens, R-Huntingdon, said his NRA-backed bill's provisions are intended as a "hammer" if "the government will not protect you — you should be able to protect yourself if you're on local government property." He said that now local governments put up no-guns-allowed signs, which he argued prevented only law-abiding persons with state-issued handgun carry permits from bringing their firearms into public spaces. His bill takes local governments to task for having gun bans and not providing security. Exceptions include mental health facilities, state Department of Children's Services facilities, school property, property used for school activities, buildings where there are judicial proceedings, law enforcement buildings and several other classifications. Senate Democratic Caucus Chairman Jeff Yarbro of Nashville and Minority Leader Lee Harris, D-Memphis, said it was bad legislation. Yarbro noted school children make 220,000 bus trips per month in Nashville and 50,000 trips in Chattanooga on public transportation. He warned it creates a conflict in existing laws on being armed around children. "We're telling someone you're guilty of a Class E felony to carry around kids, yet if called on it, you get to sue," Yarbro said as he offered an amendment that was easily quashed by Republican senators. Voting for the bill were Sens. Todd Gardenhire, R-Chattanooga; Bo Watson, R-Hixson; Mike Bell, R-Riceville; and Janice Bowling, R-Tullahoma. Also headed to Haslam is an "omnibus" package of various departmental rules, including a Department of Revenue rule that the Republican governor and colleagues in other states are pushing to force the U.S. Supreme Court to revisit its 1992 ruling involving remote sellers and sales tax collections. The court re-affirmed at the time that states could not compel out-of-state retailers to collect state sales taxes. Since then, internet commerce has come into being and is challenging traditional brick-and-mortar retailers and delivering a blow to states' revenues. On Monday, the rule, which has already been challenged in state court by internet retail and catalog company trade groups, was forced off the floor through an amendment stripping the Revenue Rule, which seeks to compel companies such as eBay to collect and remit Tennessee sales tax. Critics contended the rule was, in effect, a new tax. But Rep. Mike Carter, R-Ooltewah, argued Tuesday the rule's basic purpose is to force the nation's highest court to revisit its 1992 Quill ruling. He devised an amendment to let the case proceed while retaining the General Assembly's control until the outcome of judicial proceedings expected to last five to seven years. The House pace of acting on bills, often with little to no explanation at all, prompted Rep. Bill Dunn, R-Knoxville, to complain at one point, saying, "I know we're trying to get done but can we get an explanation [on the bill]?" * Hoping to make it harder for would-be underage drinkers to buy alcohol, the House sent to Haslam a bill requiring driver's licenses for people under 21 to be printed in a vertical format. Representatives voted 83-1 on Tuesday to give final approval to the bill. Current licenses for minors have a red bar across the edge. Senators previously approved the bill. Earlier in the session, a separate effort to require the words "alien" or "visa" on Tennessee driver's licenses held by people without permanent residency status failed. * Senators approved Haslam's Reconnect Program. It seeks to build on the success of his nationally acclaimed Tennessee Promise program by providing free tuition for older adults with no degree to attend public, two-year community colleges and Tennessee Colleges of Applied Technology. Haslam said it's key to achieving his Drive to 55 initiative, which calls for 55 percent of adult residents to have some type of post-secondary degree or certificate by 2025. It's expected to begin as early as 2018 and relies on earnings from a special state lottery reserve account. It basically provides last-dollar scholarships not covered by federal aid. The House also has approved the bill, but a Senate amendment sends it back to the House. * Watson delayed final Senate consideration Tuesday night on his municipal de-annexation bill at the request of a colleague who said he wants to offer a "friendly amendment" to the measure today. "This bill has been through such a path, almost comical at this point, I have no objection to rolling it to the next calendar," said Watson, who was stymied in passing the legislation in the previous General Assembly and has a substantially amended bill. Right now, the bill would allow 20 percent of voters living in areas that cities annexed by ordinance after a 1999 law to petition for a referendum to leave. Amendments senators attached in exchange for Watson getting the bill through include a provision requiring the referendum to be citywide. Carter, who has the House companion bill, meanwhile, has said he is awaiting Senate action but expects to push it next year. * A short-term vacation rental bill pushed by Airbnb and other internet companies is dead for the year. The Senate sponsor, Stevens, took the measure off notice for the year amid heavy opposition and concerns. Proponents have twice scaled down the bill in their futile effort to push it through, first restricting it to the state's four largest cities, including Chattanooga. As a last resort, they sought to apply it only to Nashville, but even that resulted in considerable pushback. * Representatives voted 87-0 to protect public officials from bogus liens filed by angry East Tennessee members of the "sovereign citizens" movement. Officials say some $2 billion in liens have been filed against the personal property of any number of local officials. * Voting 66-17, the House also passed legislation allowing judges to weigh a person's illegal presence in the U.S. in sentencing them on state criminal code violations. This story was updated May 9 at 11:59 p.m. with more information.